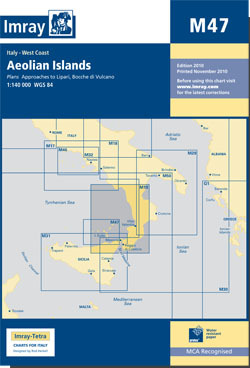 Imray Charts M Series for the Mediterranean provide coverage of popular areas on sheets specially designed for the needs of yachtsmen. The information shown on charts is liable to constant change. Corrections are made available on the Imray website. Visit this website to obtain the latest correction notices which are available as free downloads and are continually updated. Imray is now adding smart phone readable QR codes on their charts. These will provide a fast link to chart corrections and book supplements which are available at the Imray website. Imray charts set the standards for the leisure sector with award-winning cartography which features a distinctive colour scheme, coloured light sectors and fine overprinted latitude and longitude grids to make plotting easier. Imray Charts are based on up-to-date official surveys. These charts receive continual attention and amendment by skilled staff who monitor corrections to ensure that they are always as correct as possible when despatched. Charts are generally reprinted annually, at which time they are corrected to date. Once a new edition has been published the old edition cannot be corrected and is unsafe for navigation and should be replaced. Imray is based in St. Ives, England, UK. Nearly all Imray charts are printed on Pretex, a partially synthetic paper, which folds well and is durable in damp conditions. It may be drawn on in both soft pencil and ballpoint pen. Imray charts are normally published to an approximately A4 fold format and supplied in robust PVC wallets. All Imray charts are based on WGS 84 datum. Most charts are metric. Every chart includes details of the datum and projection on which it was based, to allow it to be used safely with satellite navigation systems. Details of the latest printing and edition dates of charts are available. Nog niet alle beschrijvingen zijn vertaald. Daarom staat op deze pagina de beschrijving in het Engels.